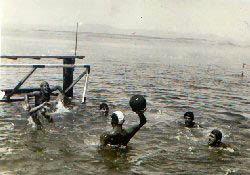 Water Polo into the sea of Crikvenica on 1939. Alfred Balen: The legend of "Spandau 04"
Alfred Balen was born in Crikvenica at the Adriatic coast on 1930. He started Water Polo at the age of 15 in the club of his hometown “C.P.K Crikvenica”. From 1950 to 1955 he played for the club of "P.K."Medvescak". On 1960 he started his coaching carrier as coach of "P.K."Medvescak". On 1965 he moved to Mexico and on 1968 he led the Mexican National team to the 1968 Olympic Games. Following his experience in Mexico he came back to Europe becoming the coach of “Wasserfreunden Spandau 04”, of Berlin. 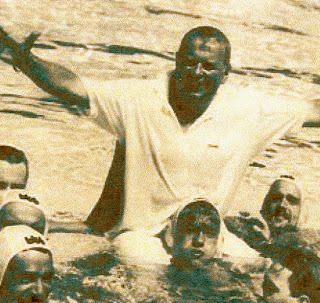 Alfred Balen, doted with a charismatic personality and deep knowledge for the Sport, managed to build the hegemony of Spandau within the German and European Water Polo. He won all the German Championships and Cups from 1979 until 1986 and also the 1983 and 1986 European Cup for National Champions. Among his players have been the well known Champions of the 80’s Rohle, Loebb, Bukowski, Hohenstein, Fernandez, Ehrl, Kison, Stamm, Freund, Grundt, Schneider. He passed away unexpectedly in Zurich on December 1986, during the European Super Cup final between his team and Mornar, Split. 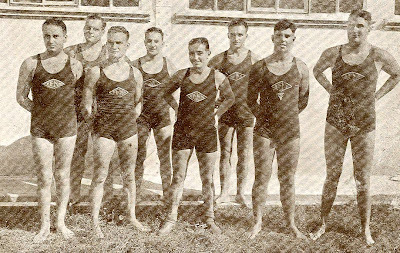 The 1914 Water Polo team of “Duisburger Schwimmverein 98”, Germany. 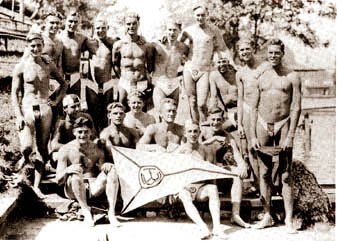 The Water polo team of Tirol “Tiroler Wassersportverein“ celebrating their win into the 1939 Austrian Championship. 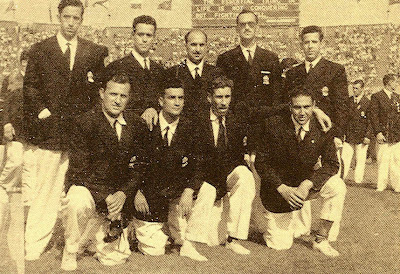 The National team of Spain that competed in London, 1948 Olympic Games. Spain, coached by Bandy Zolyomy finished 8th. The results of Spain: Spain-Sweden: 1-4, Spain-Switzerland: 5-1, Holland-Spain: 5-2, Spain-India 11-1, Belgium-Spain: 4-1, France-Spain: 2-1 and Egypt-Spain: 3-1. The Spanish team: Standing L-R: Juan Serra, Valentin Sabate, Angel Sabata, Federico Salvadores, Francisco Castillo. Sitting L-R: Carlos Marti, Jose Oriol Pujol, Carlos Falp and Agustin Mestres. Juan Serra, the goalkeeper of "C.N. Sabadell" has been the goalkeeper of Spain into the London, 1948 Olympic Games. Juan Serra has been along with Antonio Bayarri of C.N. 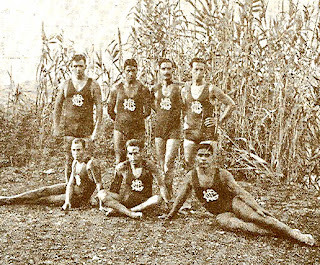 Barceloneta, the first players selected for the National team, while not belonging to "C.N.Barcelona". In the photo Juan Sierra saves a shot during the London 1948, Olympics. 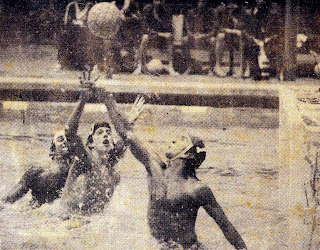 Source: Historia del Water Polo Espanol; Juan Antonio Sierra. The National team if Spain that competed against Portugal on 1945, winning with 8-0 and 9-1. The Spanish team: Juan Cruells, Ramon Borras, Ricardo Brull, Angel Sabata, Rafael Jimenez and Frnacisco Castillo. 1933: The team of "C.N. 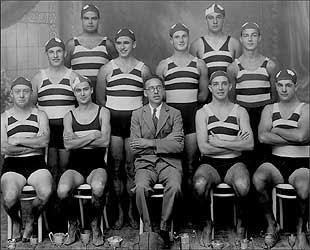 Athletic"
The team of "Club Natacion Athletic" of Barcelona Spain that on 1930 started to be a considerqble rival of the second team of C.N. Barcelona". Standing L-R: Gabriel Sust, Santiago Ulio, Ramon Artigas, Francisco Bernal. Sitting L-R: Antonio Sierra, Juan Navarro and Javier Benavent. 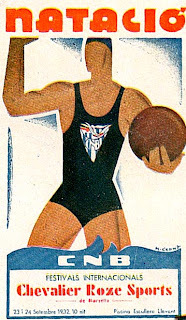 Poster celebrating the 25th anniversary of the "Club Natacion Barcelona" in 1932. To note that in 2007 C.N. Barcelona celebrates its centenary. One of the early formations of "C.N. Barcelona" called the "Blau-Croc" team. The players: Lluch, Estasen, Pomes, Gelita, Puig, Quitana. 1932: The champions of "C.N. Barcelona"
The team of "C.N. Barcelona" winner of the 1932 Spanish Championship. The players: A. Trigo, Prat, Espulgas, M. Trigo, Prieto, Zwiller, Cruels. 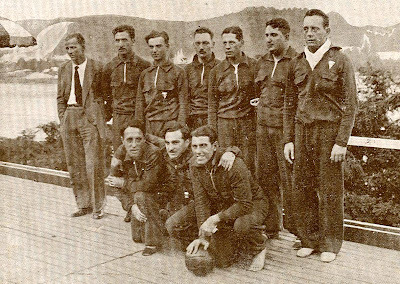 The National team of Spain during an "excursion" in central Europe from 7 to 19 July 1931. The National team of Spain represented again by the players of "C.N.Barcelona": Standing L-R: Rudy Schulz, Ramon Borras, Sema Palatchi, Juan Gamper, Rafael Jimenez, Jose Maria Puiz, Gonzalo Jimenez. Sitting L-R: Salvador Pares, Angel Sabata and Ricardo Brull. The Spanish team (C.N.B.) gave 7 matches in different countries and cities: (Karlsruhe/Neptun - Spain: 1-7, Praga/ Spain-Czechoslovakia : 0-3 and 1-0, Budejovice/ Spain - Budejovice: 13-0, Brno/Spain - Brno : 14-3, Millstadt/Austria - Spain: 2-0 and 2-0. 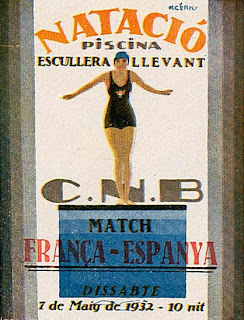 Source: "Historia del Water Polo Espanol" by Juan Antonio Sierra and "Natacio CNB 1907-1932"
Poster announcing the matche of the Spanish National team against the National team of France. 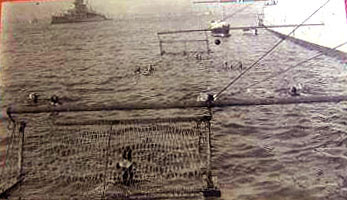 The game hase been held into the pool of C.N.Barcelona "Escullera de Llevant" on 7 May, 1932. 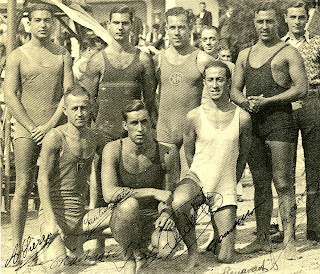 The team of Spain that took part into the Amsterdam, 1923 Olympic Games. Spain, in its 3rd presence to Olympic Games, played one match against France and lost by 5-0. The team of Spain: Angel Sabata, Gonzalo Jimenez, Jose Maria Puig, Rafael Jimenez, Jaime Cruells, Marianno Trigo and Manuel Majo. The Spanish team traveled to Amsterdam without coach and has been financed by "C.N. Barcelona" since the Spanish Olympic Committee didn't have enough money to cover the expenses of the Water Polo team. 1926: Spain vs France in Toulouse. The team of Spain that played for the 1st time against France. The Spanish team, represented once more by the players of "Club Natacio Barcelona" lost against France by 6-2. The match was held in Toulouse, France on September 5th, 1926. The team of Spain: Jaime Cruells, Antonio Trigo, Francisco de S. Gibert, Jose Maria Puig, Ricardo "Kalin" Brull, Marianno Trigo, Julio Peradejordi. The team of France: Zuffluh, Lasquin, Bulteel, Padou, Mayand, Triboullet, Cuvelier. 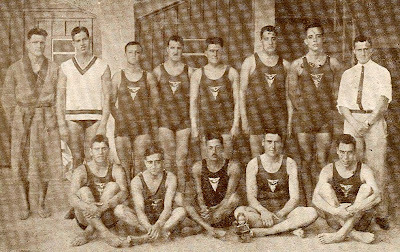 The National team of Spain represented by the team of "Club Natacion Barcelona" that played for the 1st time against Portugal in Lisbon, August 1926. The team of Spain, winner with 2-1: A. Trigo, Baste, Puig, Cruells, Brull, M. Trigo, Jimenez. The team of Portugal: Goelho da Costa, Duarte, Leote, Soarez, Garcia, Silva, Heredia. 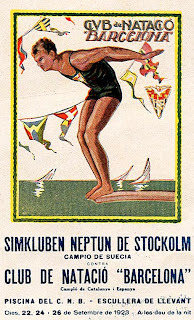 Poster announcing the matches of "Club Natacion Barcelona" against the Champions of Sweden "Simluben Neptun", Stockholm" in September 1923. The games have been held into the pool of CNB "Escullera de Llevant" on 22, 24 and 26 September. The National team of Spain that took part at Paris, 1924 Olympic Games. Spain lost 9-0 against Sweden. For friendly matches Spain won against Greece with 7-1 and Argentina 4-3. The team: Cruells, F. Gibert, Puig, Baste, Ll. Gibert, Granados and Fontanet. 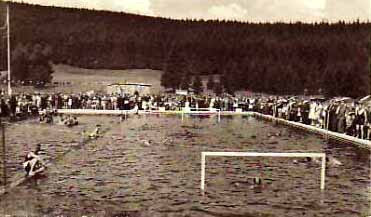 1923: The pool of "C.N. Barcelona"
The indoor swimming pool of "Club Natacion Barcelona" in 1923 as soon as the roof has been placed. 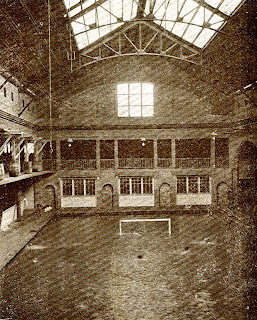 The construction of the pool has started in 1921 and ended in 1925. 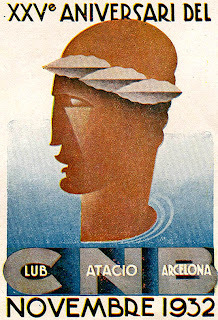 Poster celebrating the 25 years aniversary of the "Club Natacion Barcelona" in 1932. It sais: Festival Internacionals; C.N.B. 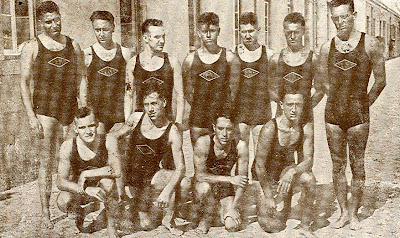 vs Chevalier Roze Sports (Marseille); 23-24 September 1932; Piscina Escullera de Levante. "C.N. Barcelona" has been established in 1907. 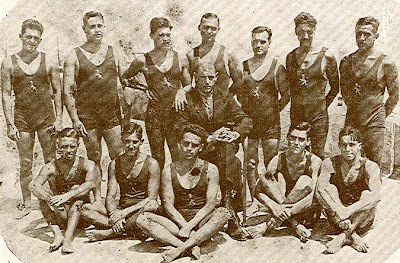 The National team of Spain, being actually, the team of "Club Natacion Barcelona" that took part at Antwerp 1920 Olympic Games. The team: Francisco Gibert, Manuel Armangue, Ramon Berdemas, Jaime Fontanet, Luis Gibert, Enrique Granados, Alfonso Tussel, Antonio Vila-Coro and the Swedish coach Albert Berglund. The results of Spain: Spain-Italy 2-1, Spain - England 0-9, Spain - USA 5-0. 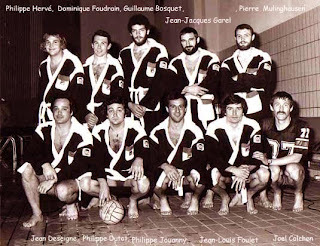 The team of “Club Nautique Havrais” that took part in the 1st division of the French Championship on 1973. Standing L-R: Philippe Herve, Dominique Foudrain, Guillaume Bosquet, Jean Jacques Garel, Pierre Mulinghausen. Sitting L-R : Jean Deseigne, Philippe Dutot, Philippe Jouanny, Jean Louis Foulet and Joel Colchen (coach). 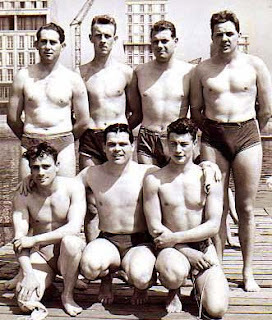 The Water Polo team of “Club Nautique Havrais” during the 1949 Championship of Normandy. The team: Maurice Lemesle, Rene Herve, Claude Bazire, Pierre Estampes, Guy Fulbert, Roland Herve and Guy Fuavel. Le Havre known as "La Porte Océane" is a city in Normandy, northern France, on the English Chanel, at the mouth of the Seine. It is the first largest export port in France. 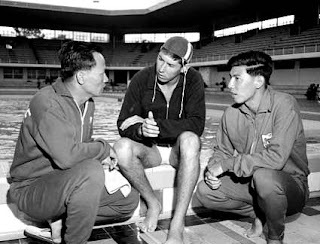 Singapore's National Water Polo players during their trip to Perth on 1966 while receiving some advice from their coach. 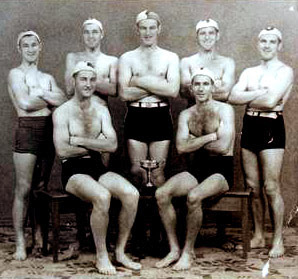 The Premiers Champions Water polo B' team of "Coburg" Victoria on 1947. The players: McFarlane, R Thompson , M Fitzgerald , R McFarlane, K Milne, R Green, W McDonald. Coburg Victoria is one of Melbourne’s, Australia older suburbs. 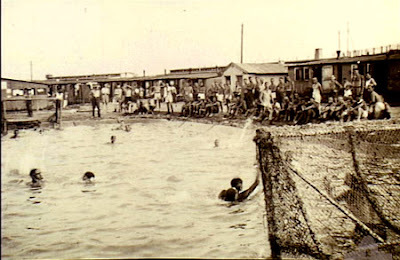 Allied prisoners of World War II (POW’s) playing Water Polo on 1943, during one of the regular "Carnival Days" held by the prisoners of “Stalag 383”. This reservoir (pool) was used for swimming, but the water was not changed in three years. The camp was situated at the foot of the Bavarian Alps, Hohenfefs, near Munich. This German POW was a special non-work camp for non-commissioned officers (NCOs) from October 1942. 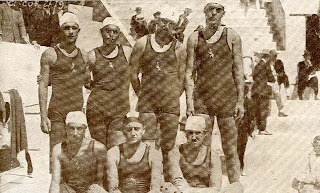 The crew of the battleship “HMS Barham” (1915-1941) playing Water Polo at the Mediterranean Sea circa 1930’s. HMS Barham was a Queen Elizabeth class battleship of the Royal Navy named after Admiral Charles Middleton, 1st Baron Barham, launched in 1914. 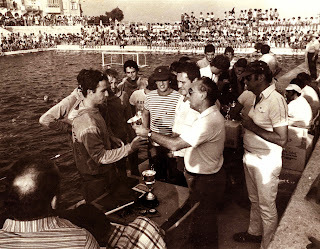 1982 : Program of the 6th "Tungsram Cup"
Bertie Muscat, distinguished personality of European Water Polo and Maltese Olympic Committee, presenting the nock-out Trophy to the captain of “Exiles Sports Club” Karol Farrugia at the Bizzebbugia (B’Bugia) pool on 1979. 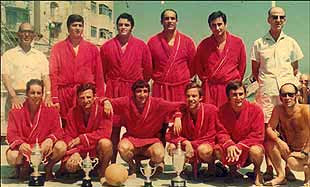 The teams of “Exiles Sports Club” at Sliema, Malta on 1972. Standing L-R: Francis Pace Lupi, Stephen Gatt, Peter Paris, Martin Frendo, Tony Camilleri, Philip Carabot, Frederick Mifsud Bonnici. Seating L-R: Edgar Montanaro, Sandro Vukovic, Vanni Bruno, Karol Farrugia, Edward Borg Barthet. Michael Soler was Malta’s foremost and outstanding Water Polo goalkeeper, one of the best players throughout the games’ history. During his career he represented Malta in major International competitions and prestigious events including, amongst others, the Mediterranean Games in Algiers, 1975 and the Mediterranean Games in Split, 1979. 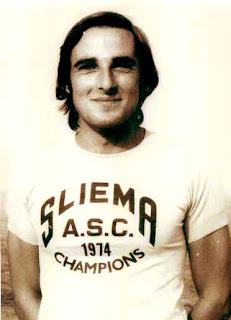 His name was synonymous with Sliema ASC whom he captained for 4 years and later went on to become the Club’s President. 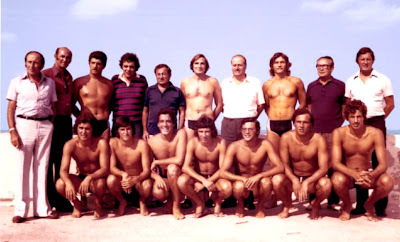 1976: The team of "Sliema ASC"
Water polo match at Braunlage on 1934. Braunlage is a health resort in Lower Saxony in the region Harz of Northern Germany. 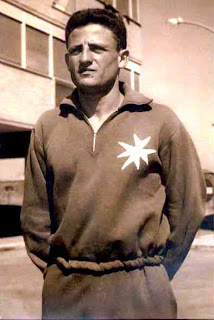 Freddie Griscti was the undisputed best ever player in the history of Maltese Water Polo. His career at the top spans more that 20 years where he won every major honour the game has to offer. He was a prolific goal scorer and an all rounder who had exceptional tactical acumen where he could read the game with great facility. He participated in the 1963 Mediterranean Games in Naples with the Water Polo team which also formed part of the Olympic Team in the same year; in 1975 the team participated in the Mediterranean Games in Algiers for which he was the captain. He was the National Swimming Champion in no less than 4 events for a number of years and in 1960 he represented Malta in the Rome Olympics in the 100m freestyle. He was winner of the national ‘Sportsman of the Year’ on two occasions. The end of the Sixties saw “Neptunes” win their fourth Championship in 1969. 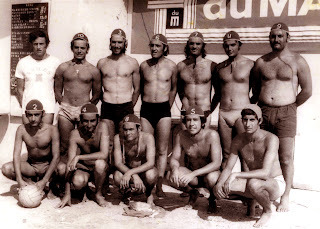 The Water Polo community was rocked in 1968 when “Neptunes” announced they had engaged the services of one of the best all-round Water Polo players Malta had ever produced, Freddie Griscti. Standing L-R: Stanley Ellul Mercer (secretary), Frederick Frendo Jones, Joe Chetcutti, Bertie Portelli, Paul Falzon, Angelo Debono (President). Seating L-R: Joseph Wismayer, Freddie Cristi, Paul Cachia, Francis Gouder, Ian Camilleri and Wilfred Mano. Freddie Portelli holding high the Neptunes, 1964 Championship trophy. Freddie Portelli, originally player of the eternal rival team “Sirens” joined Neptunes on 1964 while at that time he was gathering fame as member of the most popular musical groups at the time “The Black Train”. Later he became recognised as Malta’s top Rock Star. 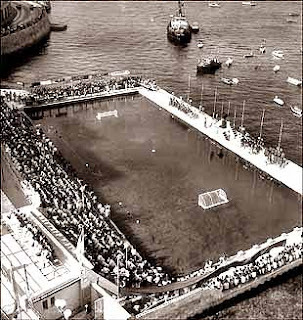 Water Polo match at “Neptunes” club of Malta and its precincts on the 50’s, thronged with people – a common sight in those days – during one of the interesting Water Polo matches. 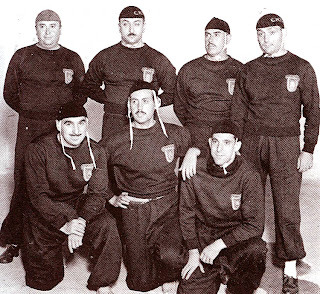 The “Neptunes” winners of the 1949 Championship in Malta. : (Back row) Franz Wismayer, Louis Demajo Albanese, Jimmy Platts, Babsie Podestà, Alex Mizzi, Wilfred Podestà. (Front row) Bertie Portelli, Lewis Wismayer, Frank Miggiani, Loris Manché. World War II broke out in September 1939 and official competitions resumed in 1945. After winning the 1945 and 1949 leagues and the 1947 and 1949 competitions, Neptunes were to face a ten-year barren spell as no youngsters could be found, able to replacing the ageing veteran stars. 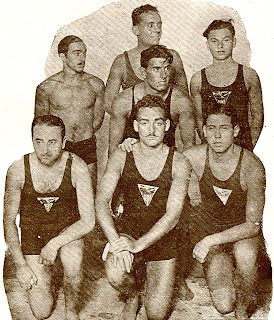 The team of “Neptunes” winners of the 1933 Maltese Championship: (Back row) Franz Wismayer, John Chetcuti, Jimmy Chetcuti, Alfred Lanzon, Paul Mercieca, Babsie Podestà. (Front row) Anthony Degiorgio, Joe Demarco, is-sur Fred, Wilfred Podestà and Joe Albanese. 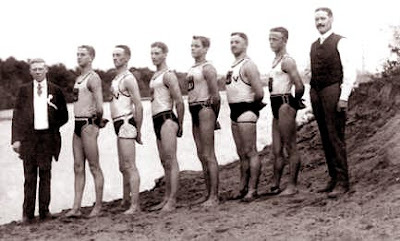 In the 30’s, “Neptunes” won the Championship on the four occasions they took part in. That was in 1933, 1934, 1937 and 1938. 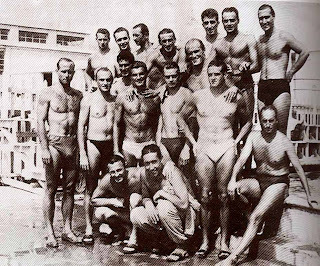 It is interesting to note that the Maltese National Water Polo team that took part in the 1936 Olympic Games in Berlin included six players from the Neptunes’ side. These were Franz Wismayer, Jimmy Chetcuti, Joe Albanese, Wilfred and Babsie Podestà and Alfred Lanzon. 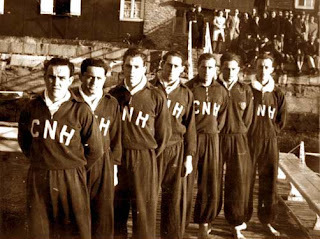 Efforts to stage the 1936 Championship officially on the National team’s return from Berlin proved futile, as other clubs did not relish facing Neptunes with the aforementioned Olympians in their side. 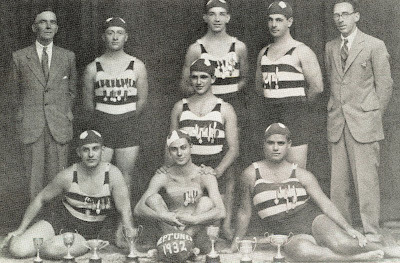 "Neptunes" first ‘official’ triumph was winning the Division Two Championships of Malta on 1932. 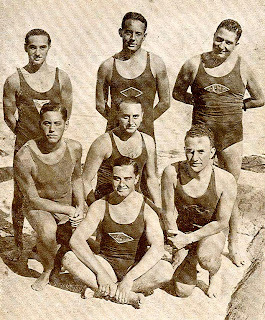 Back row:­ Lt Cdr Melville RN (coach), Anthony Degiorgio, Wilfred Podestà, Joseph Albanese, is-Sur Fred Gauci; Centre: ­ Jimmy Chetcuti; Front row L-R: ­ Francis Wismayer, Joseph Demarco, John Chetcuti. 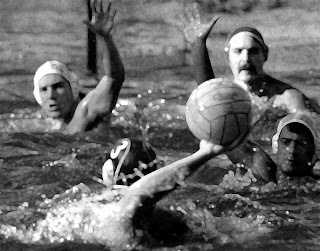 The game of Water Polo had already been in existence in Malta when Neptunes were formed. 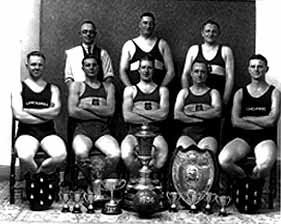 In fact the Amateur Swimming Association was founded in 1925. 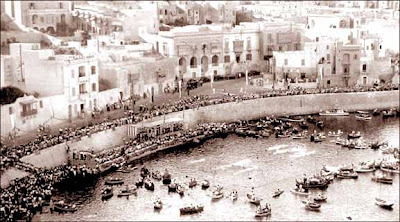 The first competitive game was in 1931, in the second division against Vittoriosa at the Sliema Pitch. Prior to this, however, Neptunes were making a name for themselves with the positive results they were obtaining when playing against teams from visiting warships. These included HMS Walrus, HMS Sussex, HMS Viscount and HMS Codrington. Teams from the British Fleet were being freely challenged and Neptunes had suddenly become the envy of all other previously established clubs. 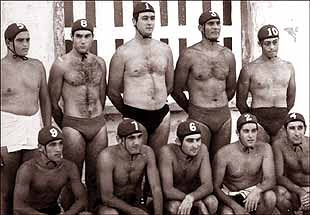 Neptunes Water Polo Club during the first International Water Polo tournament held between July 26-30, 1972. Five teams took part. These were: Greece, the eventual winners with 8 points, Scotland (4), Israel (3), Switzerland (3) and Malta (2). 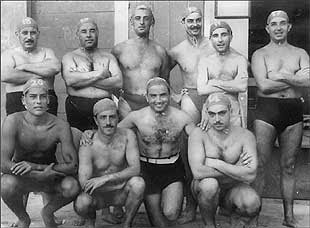 The National team of Italy that won the first ever gold medal in the history of Italian Water Polo in Montecarlo 1947, European Championships. During the competition, from 10 to 14 September 1947, Italy won against Austria 5-0, Sweden 3-2, Belgium 4-1 and tied against Holland 3-3 and France 4-4. The team coached by Pino Valle: Pasquale Buonocore (R.N. Napoli), Emilio Bulgarelli (Olona), Mario Majoni (Olona), Geminio Ognio (Lazio), Ermenegildo Arena (R.N. Napoli), Aldo Ghira (Lazio), Gianfranco Pandolfini (Florentia), Tullo Pandolfini (Florentia). Luigi Raspini (Florentia), Umberto Raspini (Florentia) and Cesare Rubini (Olona). Pino Valle is seated at the right side. 1973, Mexico: Luisinho "the angel" of Cariocas. 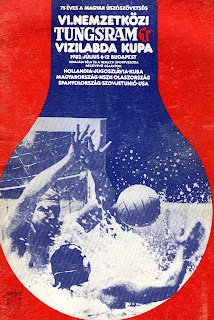 Mexico 1973: Continental qualifications in view of the 1st World Championship held in Belgrade. Photo action from the victorious game of Brazil against Canada. 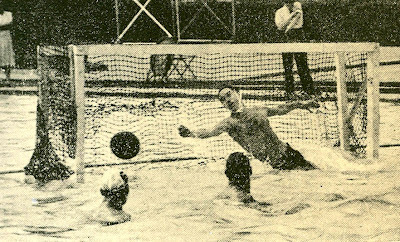 "Despite the strong defence of Brazils' captain Pincirolli (white cup), the Canadian Jim Ducharme, shots against the cage of Cariocas, but the Brazilian goalie Luisinho saves the shot, jumping high out of the water". Frank Otto, playing for Spandau 04, Berlin against the National team of Brazil in 1979 in the pool of Fluminense. Otto is ready to shoot through the arms of Ricardinho and Sanchez, while the goalkeeper Luizinho is ready to stop his shot. Frank Otto has been one of the best left handed player of the 80’s. Multi winner with Spandau 04, Berlin, winner of the 1983 European Cup for National Champions and winner with the German National team of the gold in Split, 1981 European Championships and silver in Los Angeles 1984 Olympic Games. The famous Hungarian coach Bela Rajki on 1982 presented an article concerning his great talent. Here is what Rajki said: “In my opinion Frank Otto is the best left handed player in the World. The ideal title to a photo series on his movement would be “ the role of wrist in the development of the shooting action”. It was the perfect technique of the wrist, the complete security in handling the ball that were the most striking features noted in the play of Otto. The photos were made as he prepared to shot while moving fast in the water. Otto gives perfect “hold” to the ball, even in the fastest movement, with the help of his wrist, perfectly adapted to the rhythm of his arm action. The ball almost “sticks” to his palm in every phase of his movement. 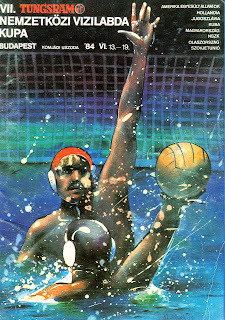 Source: Magazine International swimming and Water Polo; 1982/2. 1965: The team of "C.N. Barcelona"
1919: The team of "C.N. Athlelic"
1917: The pioneers of "Club Natacion Athletic"
1932: The winners of "Rari Nantes Milano"
1964, Tokyo: The golden team of Hungary. 1986: The Champions of "Stanford University"